One of the ongoing struggles that I encounter is soil quality. Mine is crush granite. An absolutely terrible soil for growing things. All the experts talk about soil amendments and improvements. I am annually working organic materials into my garden beds. My first choice is composted chicken manure and coop cleanings. It is something that I have plenty of. When I lived in the Midwest I could flip a couple fully worked compost piles a year. Here even with diligent work the high altitude makes it much harder with less oxygen, drier environment, cold nights, and short season it really does take nearly two years to get a batch ready for use. These are the only compost piles that the worms never move in to, and I think it is because no worms reside in the soil around my house. Then once I add it to any garden bed or dress any tree in only a couple years any thing that I add is fully absorbed and my soil is back to the state it was before. This weekend I put three tomato plants in a flower pots on the deck and am getting the new raised beds ready.I am moving to raised beds. I am enriching each of these with my wonderful compost. Raised beds allow me to extend the period that the new improved soil lasts, but even then experience has shown that it quickly is absorbed in to my soils looking for a better lot in life. Lets see how this all plays out when I plant my cold weather veggies later. 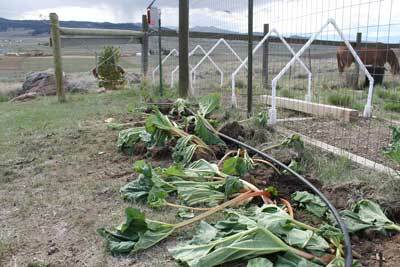 Many of you wrote and emailed me about the use of cold frames to extend my short season here in Montana. I have worked with this idea on and off in my time in Montana. It is a perfect solution in so many ways, but I have struggled with how to beat the winds that blow here. My cold frame worked something like this. We have tried the simple traditional cold frame of a raised bed with a window on the top. The picture here is an online picture and not mine, but it was very similar. It works well early in the season before you need to prop open the window. Once I needed to prop open the window all bets were off. I sit up slope on a hillside in a wide valley that funnels wind. Though you would imagine that the winds always come from a single direction they can come from any direction and change in a nanosecond. We can be victim to sudden down drafts as well. The wind here is constant like the surf of an ocean, some times strong and violent like crashing waves and other times no more than a gentle breeze like the sounds of water lapping at the shoreline. It is hard to imagine living with this kind of wind constantly until you experience it. In all the places I live this is one of a kind. The winds here have created hail and blown shingles off, such that we went through almost a package before we gave up and went metal roof. The wind has blown tables and even gas grills off of our deck. Metal lawn chairs have tumbled and blown across the yard until they were stopped by the pasture fencing. What all this means is the idea of propping open a window on a cold frame doesn’t work. It is either gone or if tied down when propped open a mangled twisted mess once the wind fights with it. I am still working with the cold frame idea and my raised beds are still intact, but I need to do some serious out of the box thinking to see if I can come up with something that will work to provide heat in early and late seasons. I am watching Craig’s list, Free Cycle, the classifieds and even thinking of visiting the Habitat for Humanity recycle store for a couple of windows to try this again. But I am in high thrifty mode as the windows ended up a broken mess and until I can solve the wind problem I am not too anxious to spend too much. This time I will take some pictures and share with you some of the options I try. Spring in Montana – This Means Snow! This week has been full of reminders of what spring in Montana is like. Snow and more snow. Almost everyday we woke up to snow. We were just above the snow line. Spring will not happen for us until the snow line moves up another 1,000 feet. For us that means sometime in June. Today it feels like an eternity into the future. 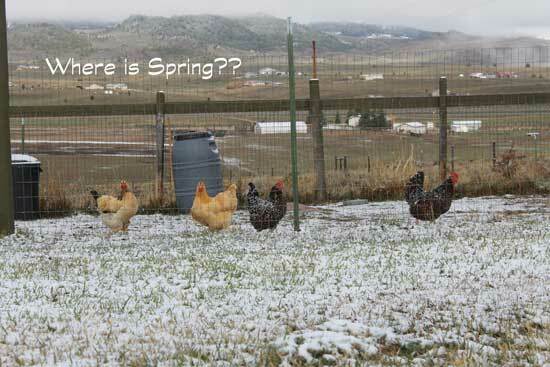 Even the chickens are wondering if we will have snow every morning this spring. As much as I am ready to turn the soil and put seeds in the ground I know that we will have night-time freezes for weeks to come. For some reason this year I am not ready to wait that long. It means that I am going to need to explore season extenders that will work with my low temperatures, occasional snow, regular frosts, howling winds and a small budget. No putting seedlings in the ground and covering them occasionally with sheets. This is going to take a plan and daily effort to get things to go all the way to harvest. So I hope you will follow along and give me your thoughts and suggestions as I figure out how to extend my growing season on a shoestring. My Craig’s list search worked! I got two replies and one of them panned out. The folks were thrilled to get rid of plants that they had no use for and to not end up with big holes where they were. I got three overgrown plants that were too far gone to try to transplant. I did it anyway. For the cost of three bags of soil, which was less than one of the many nursery pots of rhubarb I bought, I got three huge plants. I brought them home split them and planted them. Now we can cross our fingers, treat them well, and hope that few of my new splits make a go of it. Next year at this time I will have at least a couple new plants, if I am lucky more than that. My family was here last week from the Midwest, the land of long growing seasons and plenty of water. They were amazed when we had frost twice in their four-day stay. Where they are from the average last frost is the last week of April and that long growing season won’t end until frost arrives some time in mid to late October. Our average last frost is late June or early July and less than 60 days later in August our first frost of the fall will arrive. When compared to where we live in Montana, the Midwest is the promised land of milk and honey. Produce is local, good and plentiful. You have more than you can use and share with your neighbors. It is one of those things that I miss most a garden and produce. My uncle must have said several times each day you need a greenhouse and he is so right I do. I am putting that on my wish list right now, a greenhouse. Most folks don’t realize that Montana has regions known as high cold desert. We live in one of those areas. A desert is a dry, region of little rainfall, extreme temperatures, and sparse vegetation. The nearest town to us, which gets more moisture than we do, gets an official annual average moisture of 12.78 inches. To put this in perspective Tucson gets an average 11.59 inches of rain annually. Our extreme temperatures are not hot, but cold with wide swings daily. We have acreage and it naturally has bunch grass and a couple of scrub junipers. In the ten years we have lived here we have tried to grow more trees than we can count. 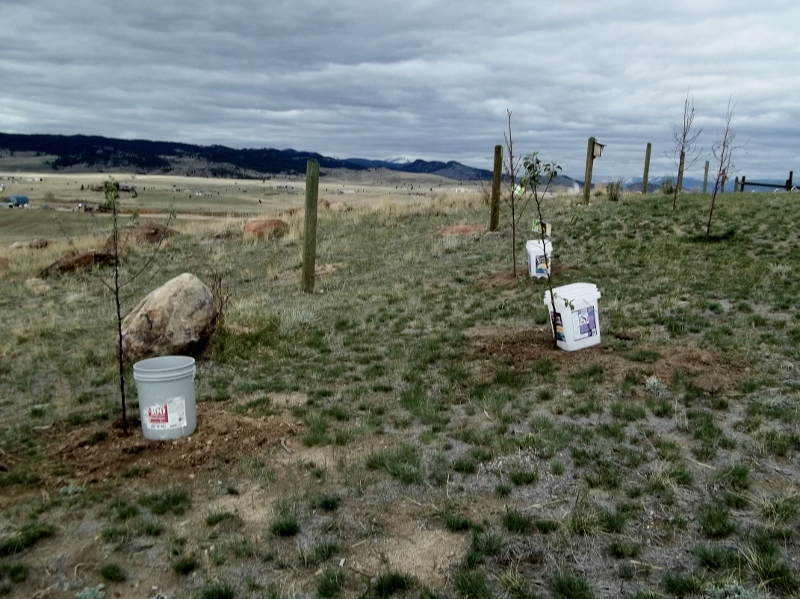 Most of those trees we have transplanted have never made it through the first year. We have bought local nursery grown and dug trees from the wild. Neither has a better chance of success. By necessity, we have created an ad hoc irrigation system that gives trees a leg up that first year. Here is how this system works. For each tree or bush that you transplant you need some thing that holds water. I have used old cat litter buckets, 5 gallon pails, and wastebaskets from shredders that have long since died. Be creative, don’t spend money on these “buckets,” scavenge them from your friends, Craig’s list, and painters. Once you have found your buckets you need to drill two small holes in one end or side of each bucket. This holes need to be very small, less than 1/16th of a inch. This sounds small, but you want a slow dribble so that the moisture in the bucket all works it way into the soil around your transplants. You can always add more holes or make larger holes, but you can’t undo holes you have drilled. Progress slowly with your drill. Put your buckets next to your transplants. Move your bucket around your transplants each time you fill them to encourage root growth in all directions. When you fill your transplant bucket you can add root stimulation powder or fertilizer as needed, but don’t over fertilize the first year. You want to encourage root growth that first year not top growth. How often you fill the buckets depends on your local moisture. You want to encourage good deep root growth. It is a bit of guess-work or gut instinct as to how often you fill your buckets. You may need to put a rock in the bottom of the your buckets to hold them in place in windy areas. I like this system because it concentrates the water where it is needed. It is an inexpensive system that anyone can do with a hose. The idea of running a sprinkler a.k.a. our well nonstop for an hour to get 1/2 inch of moisture, offends my sensibility. One of the upsides of this method is that if you suddenly find your area in an unusual dry period, you can pull those buckets out and give any plant on your property a slow drink of moisture. Hope that this system helps others with transplants.